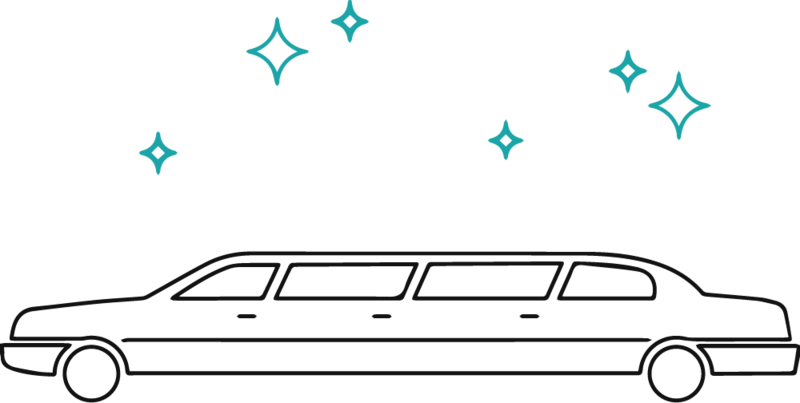 Looking for limo hire in Bridgend and want a service that's reliable, affordable and easy to organise? Get in touch with us today to find out more about our great deals on luxury limousines. Planning a big night out? Whether you're organising a tour of Bridgend's pubs and bars or heading into nearby Cardiff to sample some of the city's lively clubs, hiring a limo is a great way to enjoy the VIP treatment all night long. We've got party buses, stretch sports cars, novelty limos and more, plus our huge Hummer limos complete with features like karaoke machines and light up LED dance floors. We'll provide a uniformed chauffeur to take you and your friends wherever you want to go, leaving you free to relax and enjoy the ride with a glass of complimentary champagne. Our limo hire service is also great for those who are getting married in Bridgend or the surrounding area. Whether you're planning an intimate gathering in a local church or a big celebration for hundreds of guests, we'll make sure you arrive in comfort and style. We've got a wide range of classic cars including Rolls Royce limo, Lincoln town cars, Chrysler limos and more, as well as a choice of more modern designs. From pink limos and Mini Cooper limos to stretch Ferrari limos complete with state-of-the-art sound systems, we've got something to suit every taste. All of our limousines are equipped to the very highest standard and are available to hire for just a few hours, a whole day or as long as you need. So whether you want something special for your wedding day or a fun, exciting vehicle for a night on the town, our limo hire in Cardiff has the perfect vehicle for you.